As more and more clients are working with contractors and other self-employed workers, the administrative time spent handling these workers is increasing. There are W9 forms to collect, payments to make and 1099s to prepare and deliver. All these things are time consuming and can be quite stressful come January. Isn’t there an easier way to deal with all these tasks? Yes, there is! QuickBooks® Online (QBO) has rolled out two great features – W9 Self-Setup and 1099 e-file and e-delivery– that will make you and your clients’ lives much easier. By utilizing these features, you will save yourself and your clients time and effort by not having to chase down information from contract workers, and you will have a more secure process for collecting, entering and sending out tax information. No longer do you or your clients have to collect W9s and enter all the information into fields upon fields in QBO. This can be part of your onboarding process of a new contractor or freelancer. No longer will you or your clients need to chase down W9s in January! By simply entering a contractor’s name and email, you can invite that worker to more securely enter all the information for you. Once the contractor receives the invite, they will be asked to create a free Intuit® QuickBooks Self-Employed account to complete the W9 online. QuickBooks Self-Employed allows the contractor to have separate business and personal expenses, maximize their tax deductions and send simple invoices. If the contractor already has an account, he or she can easily share their data with your client without having to fill out another W9. 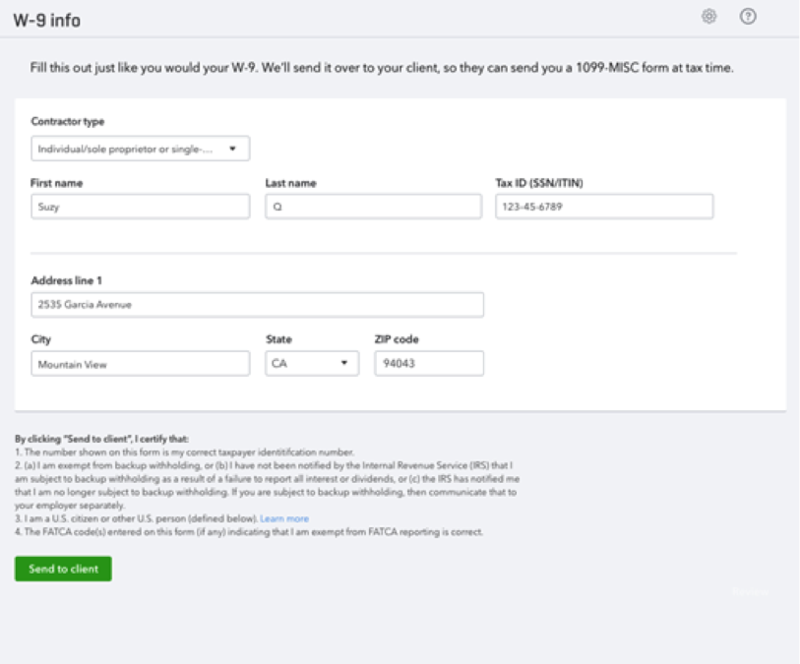 Once they have the W9 filled out, their information will automatically be available in your client’s QBO. By moving these processes online, it means less work for you and your client. You will be able to easily capture the necessary information required for filing 1099s come January. AND, it will be more secure, so you don’t have to worry about the sensitive information contained on a W9. 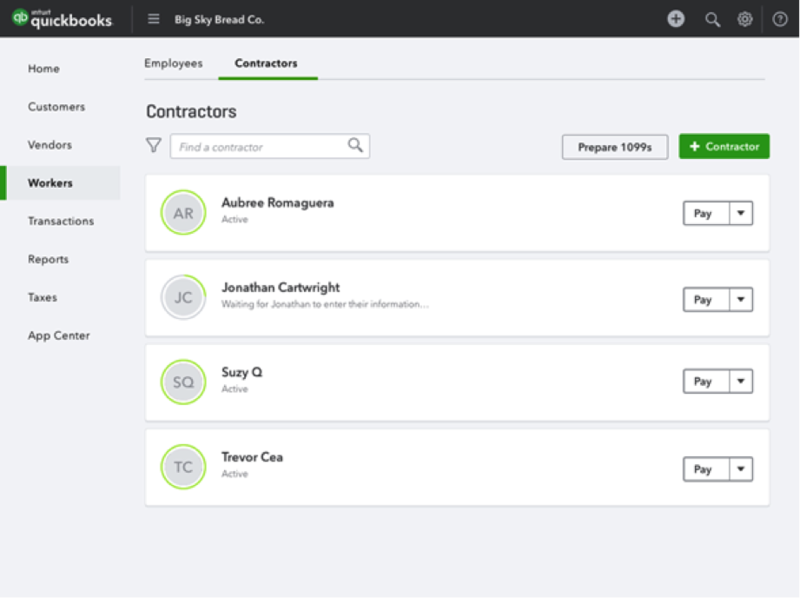 Another feature that QBO has added is the e-filing of 1099s and e-delivery, making your life easier when dealing with contract workers. Those of you who have used QuickBooks Online Plus have already been able to e-file your clients’ 1099s, but now everyone who uses any level of QBO will have access to this great feature. When you e-file through QBO, the information about the 1099 recipients is already populated. You don’t have to retype anything, which means less mistakes and more time for you to enjoy your January instead of being stressed. In addition to e-filing, a brand new feature for all levels of QBO is that Intuit will deliver your 1099s electronically and in the mail. Meaning, you no longer have to print out 1099s and bring them to the post office because Intuit will do that for you. And, with the e-delivery feature, the 1099 will go to the contractor’s inbox instead of their mailbox, so you don’t have to worry about them getting lost in the mail. To start the e-file process, go to the contractor’s tab and click Prepare 1099s. Review your company details:where you verify the name of the business, address, phone, email and EIN. Assign your vendor payments to 1099 categories: where you map out the accounts that belong in certain boxes on the 1099. For example, Box 7 is nonemployee compensation, which is where most contract workers gets categorized. Confirm your 1099 vendors:where you double check to make sure every vendor has the necessary information entered to provide a 1099.
Review 1099 vendors and payments:where you make sure the dollar amounts and 1099 boxes are appropriate for each vendor. Within a few simple steps, you are ready to go to the 1099 e-file service to finish the process. Once you are in the e-file service, you will be able to enter the payment details and be given one more opportunity to review the contractor information before submitting it for e-file. You will also be able to give consent to e-deliver 1099s for no additional cost. 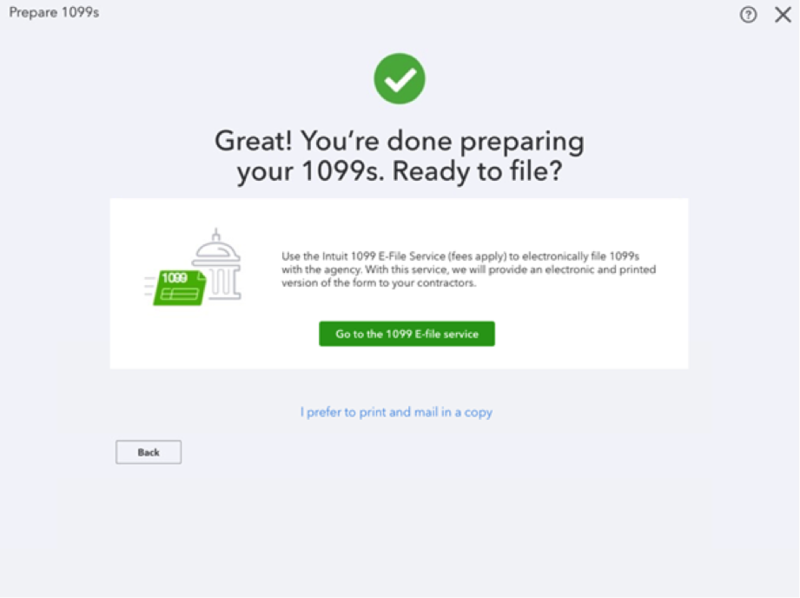 As soon as you have e-filed the 1099s, the contract workers will receive an email that their 1099 is available and ready to be retrieved in QuickBooks Self-Employed. QuickBooks Online is constantly improving and adding more features to make you and your clients’ lives easier. With these two new ones, you will get to take a vacation in January instead of working all the time. So, start sending out W9 invites now, so that when you hit 1099 time you will have all the info you need.